Ok, what shall we buy? Most of the stalls have the same style and designs..
Should I get these towels.... er... I guess no need ler... right? 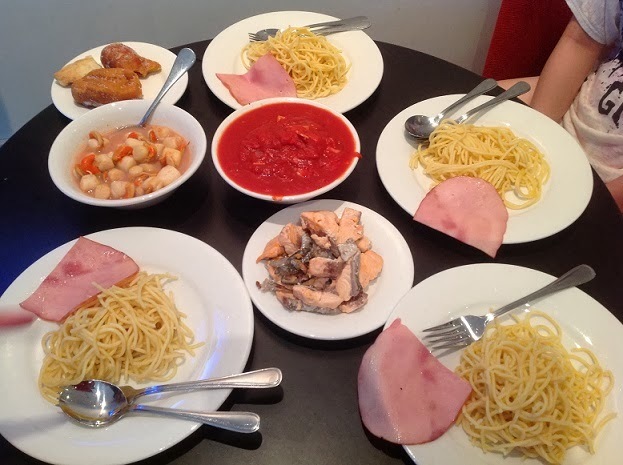 We ended up cooking spaghetti with ham and bacon... fresh scallops and lightly pan fried salmon! Hahaha!! !....YAWNING....poor boy, has to carry backpack and hands loaded with goods.Two ladies, enjoying their shopping freely. Wow, that's a nice lunch. hahahaa... child labour... but nonetheless, he is a most willing carrier man.. Ya...going overseas, if you buy food and cook your own, it is a lot cheaper than eating outside...and nicer too. I think their salaries too high...so the cost is charged to the customers in the prices of the food. Yeah, you had a point there... normal meal is around $10 so might as well cook some nice meals with that kind of money... but most meals taken out too.. wanna try the western food..
For me, I'll pick some t-shirt!!! Yea, buy 10 free one..but we didnt end up buying 10... too bad! What you got for me ? Yes, definitely not cheap cos we got to times 3!! Fresh seafood is so delicious! Family bonding time - cooking together. 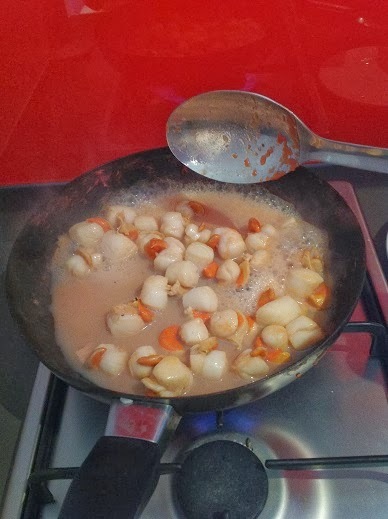 Food is simple but fulfilling with delicious seafood. Was about to ask yesterday did you buy some food from the market to cook in your apartment, and today, saw your post liao cooking in the apartment, yay! Oh yes, agree with you "lui yan chin yung yi chan" (ladies money easy to get).. Haha.. Almost anything also we can buy.. Drop me anywhere, I can buy anything although I don't plan to buy anything.. Your home-cooked lunch looks good, I like. But I prefer white sauce to bolognaise.. The next time maybe can get your kids to do carbonarra cream sauce.. Can't wait! Yes, provided don't keep counting the money..then nice! hahaha..
wow so nice being able to cook your own meals.